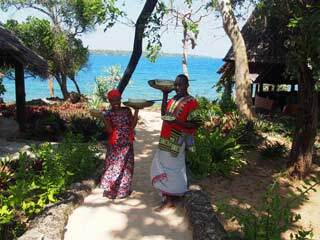 Lunch with Pilli Pipa is one of the highlights of the day, prepared and served by smiling Swahili ladies. We take pride in offering only the freshest of produce from the region. 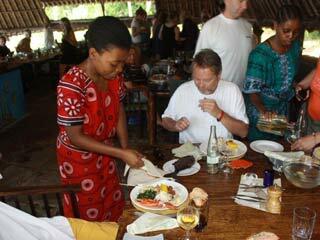 Our menu begins with a fish/ vegetarian soup fit for a sultan served with chapati (Swahili 'pancakes'). This is followed by fresh Indian Ocean mangrove crab with a delicious coriander, butter sauce; crisp goujons of fresh fish, flash fried and served with a coconut and lime dipping sauce; Swahili coconut rice, cassava (maniok) a vegetable cultivated widely within the area, and seasonal salads. Those who are not seafood lovers can have the choice of our delicious free range chicken, grilled or Swahili Style in a sauce. 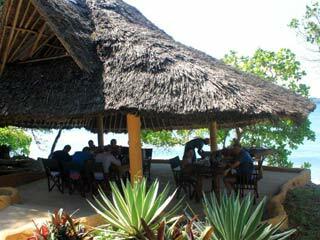 Vegetarians are also catered for with various selections of Swahili Style dishes. Relax in our spacious 'Day Dreamer's Lounge' sampling our fresh patisserie, seasonal tropical fruit, fresh Kenya coffee or citronella tea made from lemon grass grown in our garden. Browse through our Marine library, do some bird watching (regular visitors are Brown Headed Parrots, Sunbirds, Green Pigeons, Bulbuls, Ibis and Fish Eagles- just to name a few! ),or just admire the breathtaking ocean view. Relax around our swimming pool, sampling tropical fruit, home made shortbread, fresh Kenya Coffee or Citronella Tea made from fresh lemon grass grown in our garden. 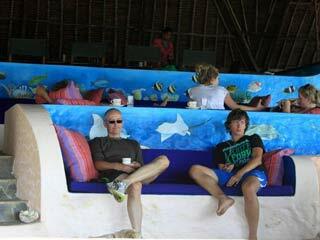 Browse through our Marine Library and do some bird watching or just admire the beautiful ocean view. The variety of birds is immense. Regular visitors are Brown Headed Parrots, Sunbirds, Green Pigeons, Bulbuls, Ibis, Palm Nut Vultures, and African Fish Eagles). Something to please the serious Ornithologist as well as the regular visitor. Monitor lizards, Sykes monkeys, wild goats and dik-diks (small antelopes) are amongst the inhabitants. Other points of interest are the fossilised coral on the island. For those staying longer there is a chance to do a tour of the boardwalk showing naturally exposed formations of coral at Wasini village.